ALL TRANSCRIPTIONS UPLOADED. Transcriptions for lessons portion uses the Soundslice notation. 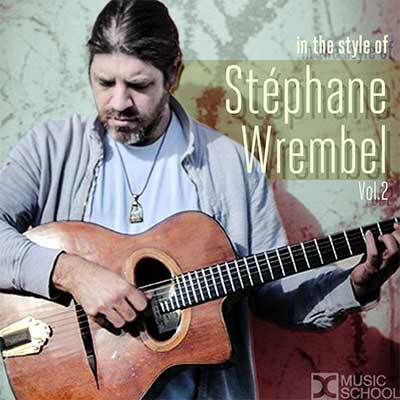 An in-depth study on the Jazz style of guitarist Stephane Wrembel. -Lessons where Stephane shares his approach to music. New York Observer recently said, "Stephane Wrembel represents the living face of Gypsy jazz." Rolling Stone Magazine has called him “a revelation”. Stephane Wrembel is best known for “Bistro Fada,” the theme song from the 2011 Woody Allen Oscar winning film, Midnight In Paris. Subsequently, Wrembel was hand-selected by award winning composer/producer Hans Zimmer to perform at the 2012 Academy Awards® as part of his “All Star Band.” Later that year, Midnight in Paris won a Grammy Award for “Best Compilation Soundtrack for Visual Media”. Wrembel has contributed music to two other Allen films, a variety of commercials, and even helped Gentleman Shaver win a Clio Award for “Best Original Song Used in a Commercial”. He has toured around the world, and is very active on the musical scene in many countries including USA, Canada, France, Israel and India. Recently, Stephane has performed as a headliner at the legendary Carnegie Hall in New York and at the Festival Django Reinhardt in France. Wrembel has also headlined at Lincoln Center, played major festivals, recorded with mandolin legend David Grisman, toured with master violinist Mark O’Connor and shared stages with everyone from Elvis Costello to Patti Smith to The Roots. The Gitane guitar company has even named a model after him. To say that Stephane Wrembel— who learned his craft among the Gypsies at campsites in the French countryside— has already had a remarkable career would be an under-statement. This virtuoso guitarist from France has truly just begun to make his mark as one of the most original guitar voices in contemporary music.